What's a fan of strategy games supposed to do when all around him or her there's news of delayed tactics/strategy games, metamorphosized strategy games and, well, not a whole lot to be cheerful about? 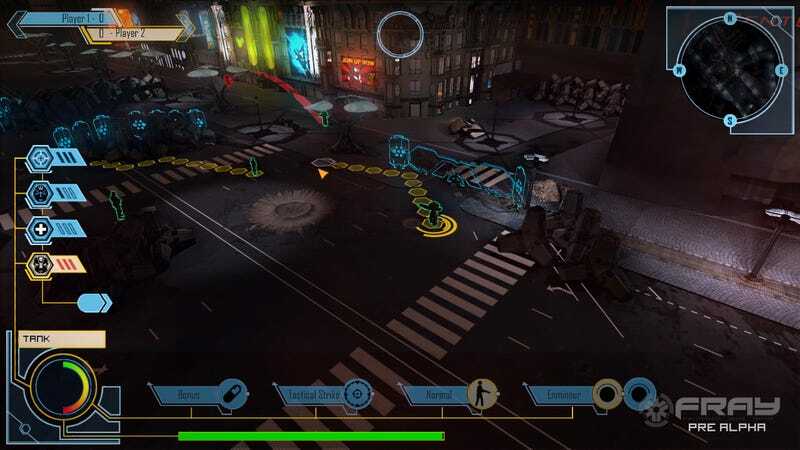 This game is isometric, involves some sort of soldiers fighting soldiers with the orders assigned in turns (taken simultaneously by all players), then executed across a hex-based grid. The action then plays out in real-time. But what's with the lack of games in this genre lately? The biggest problem with today's gaming industry in regards to squad-based strategy, is that real-time is not the right fit for the genre (although Dawn of War 2 would say otherwise), and they are traditionally turn-based, a genre which scares the big majors, as it is considered too niche. That doesn't mean that the genre is necessarily dying, new titles come out each year, but its public is unfortunately limited, mostly because most gamers don't even know of the genre, having discovered gaming in the past ten years. Gamers must therefore count on independent studios to satisfy their tactical needs, to challenge their reflection after a fast paced action game, where twitch mechanics rule. With Fray we hope to introduce FPS gamers to strategy games, with an action packed game that also requires some thought. Fighting games came back. Let's see this genre come back too, huh? Or are you pushing for flight sims instead?